A list of the best art and antique stores in the islands of venetian lagoon. 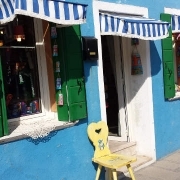 Inspired by the colors of this beautiful island, the workshop I Colori di Burano offers unique souvenirs, decorated and painted by hand with creativity and passion. I Colori di Burano, buy online: you can send your enquiry to "I Colori di Burano" by clicking on its name and visiting its own page. 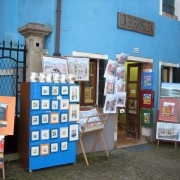 In our small shop you will find Giuliano Carraro's paintings which accompany without fail your photos of Burano. La Buranella, buy online: you can send your enquiry to "La Buranella" by clicking on its name and visiting its own page.